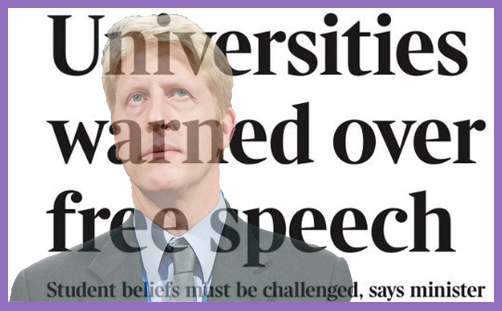 Universities Minister Jo Johnson delivered a much-trailed (..and here, here, here…) speech about the imperative of academic freedom of speech, which he says must be guaranteed on pain of universities being “fined, suspended or deregistered, if they do not protect free speech within the law”. So if, say, the University of Oxford clamps down on freedom of speech “within the law”, it may be ‘deregistered‘ (ie, cease to be able to award degrees). Right… like that’s going to happen. His speech has been universally lauded as a welcome intervention against the increasing ubiquity of ‘safe-spaces‘ and the deployment of ‘marshals‘ whose task it is to ensure that no visiting speakers (like Jacob Rees-Mogg) dare to voice ‘offensive’ views. And so, at long last, we have in Jo Johnson a politician who prefers red intellectual meat to milk; one who doesn’t mind melting snowflakes with the heat of robust argument; one intent on restoring academic freedom of speech and reclaiming debate from the illiberal liberals who decide to find offence under every cornflake – that is if they haven’t imposed the mandatory consumption of quinoa flakes for a safer gut feeling. But there’s a problem with Jo Johnson’s speech – actually, there’s quite a few, but you’d struggle to find any reasoned exposition of them anywhere: it’s almost as if a speech by a Tory minister lauding freedom of speech in universities were sufficient to restore freedom of speech in universities. 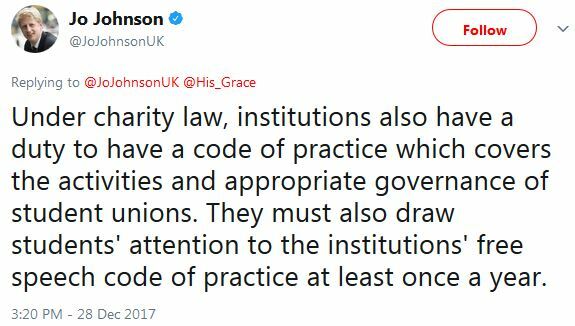 Or perhaps it’s simply that universities have never actually surrendered academic freedom of speech (“within the law”), and so Jo Johnson is preaching to a congregation which is already singing from his charismatic chorus sheet. Jo Johnson could have added Germaine Greer, who was no-platformed for apparently being transphobic, and there are multiple other examples of students protesting the presence of speakers who might upset them. The thing is, these aren’t university policies, but those of student unions or independent student societies: if, for example, the National Union of Students determines to have an official no-platforming policy (presently limited to Al-Muhajiroun; British National Party (BNP); English Defence League (EDL); Hizb-ut-Tahir; Muslim Public Affairs Committee; and National Action), then that surely is entirely a matter for them. If another student union wishes to add Ukip or pro-Israel (/Zionist) speakers, they are free to do so “within the law”. Jo Johnson appears not to be able to tell the difference between official university censoriousness and partisan student zealotry. They are patently not the same thing. So what is the Universities Minister actually saying? Is it that universities must ensure that student unions and student societies invite speakers whose views may be unpalatable to some, and that student attendance is mandatory? Or is it that autonomous student societies must ensure ‘balance’ quotas, so that (for example) every pro-choice feminist speaker must be off-set with a pro-life misogynist, and every pro-Palestine freedom-fighter with a pro-Israel Zionist? Who then judges the optimal incarnate polarity? Who discerns whether the medium impedes the message and so an unacceptable bias is perpetuated? Surely students ought to remain free to ‘no-platform’ whomever they wish? Isn’t that their freedom of expression? These student-society talks do not form part of their degree courses: they are self-inflicted, extra-curricular enhancement. If young minds cannot (or do not wish to) cope with reasoned argument or contrary opinion, who is Jo Johnson to impose it? Isn’t it students who pay their subscriptions? Isn’t it their own money which incorporates them? Isn’t it their own time which they devote? Why should the Universities Minister presume to interfere with the stated objectives, purposes and activities of a private membership organisation? 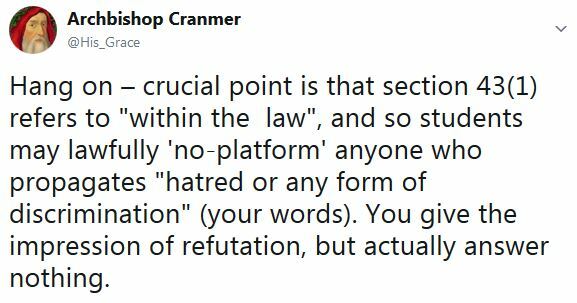 And by ‘no-platforming’, let us be clear that an invitation extended by the student body and a speech opposed by some does not constitute ‘no-platforming’. Indeed, the Guardian notes that some of those more high-profile examples of ‘no-platforming’ were not ‘no-platformed’ at all: Peter Tatchell addressed his audience, and so did Germaine Greer, and so did Jacob Rees-Mogg. So it isn’t so much a restriction of the freedom of speech as the freedom to speak met with robust contrary free speech. Interestingly, examples of real ‘no-platforming’ which Jo Johnson omitted to mention include Peter Hitchens, who refused to sign a ‘free-speech contract’ (ie vetting the speech and noting those attending) at Liverpool University, so he gave his speech on a soap-box outside the university walls; and Tim Stanley, whose talk on abortion at Oxford University had to be cancelled over ‘health and safety’ concerns. When a guest speaker is confronted with a coercive contract or threatened by an unruly mob, such that to take the platform becomes collusion with illiberalism or an endangerment to life and limb, then freedom of speech is indeed curtailed – but by an anarchic student body; not official university policy. And it’s interesting to note at this point that Jo Johnson chose to ignore the prominent ‘right-wing’ victims of genuine cases of no-platforming (whose subjects were drugs [against] and abortion [against]) in favour of left-liberal LGBT heroes of gender and sexual orthodoxy, who were not always actually ‘no-platformed’ (and some ‘no-platformed’ themselves [ie didn’t show up] in protest over how their friends had been treated). Why didn’t the Universities Minister mention Peter Hitchens, Tim Stanley or even Jacob Rees-Mogg? In the latter case, the media-hyped threat of ‘no-platforming’ was no worse than that endured by Peter Tatchell, so why laud the LGBT human rights campaigner and not the pro-life pro-marriage Roman Catholic? No British university is going to tolerate racism, and (pace SOAS), none is going to countenance anti-Semitism. But Jo Johnson also says there is no place “for hatred or any form of discrimination”, and here we begin to understand why it is not universities which are the problem, but the government’s ‘hate speech’ legislation, for when ‘hatred’ is in the eye of the beholder, and includes (according to the CPS) “ill-will, ill-feeling, spite, contempt, prejudice, unfriendliness, antagonism, resentment and dislike”, there’s a manifest freedom tension. Are Brexiteers not rendered ‘haters’ by this definition? Are not all those who oppose universal inclusion into everything for absolutely everyone everywhere? What if a future government determines that criticism of the European Union constitutes ‘hate speech’? And that is why ‘Prevent‘ is so subversive and potentially injurious to academic freedom. In order to prevent Islamists from infecting young minds with the virtues of head-hacking jihadism, the British Government (mindful of and sensitive to [vote-losing] allegations of Islamopobia) forced universities (indeed, all places of education) to root out all forms of ‘extremism’ – that is, any opinion which does not conform to their notion of ‘British values‘ (ie equality, tolerance and respect). From there, it doesn’t take much to grasp why pro-abortion feminists might find Tim Stanley ‘extreme’, or gay-marriage advocates might find Jacob Rees-Mogg ‘extreme’. For the self-styled ‘safe-space’ marshals, Wahhabism and Evangelicalism hail from the same arid theological desert; Salafism and Roman Catholicism are both equally offensive because both discriminate against women and gays. But Jo Johnson doesn’t mention ‘Prevent’, for some reason. For him, there is simply “no place in society… for any form of discrimination”, and so, presumably, no place to preach the inequitable, intolerant and disrespectful gospel that salvation is to be found in Christ alone. And so Jesus would be banned from speaking at a university – by both anti-Christian students and the ‘Prevent’ duty imposed by government – because he offends sinners and goats and people who make a public display of piety. 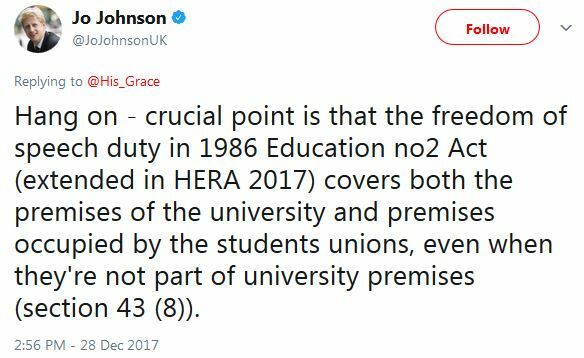 If educational establishments have a statutory obligation to protect their students from all forms of harassment in order to ensure that “the rights and dignity of all members of the University community are respected”, then Jo Johnson has just reinforced the very ‘no-platforming’ policy he professes to oppose. Finally, we come to the genuinely important instances of universities inculcating partisan orthodoxy or limiting freedom of academic inquiry. This is where Jo Johnson ought to be focusing his ire and directing his threats of ‘deregistration’, for when a university permits the establishment of self-perpetuating power bases or censors valid research in case it offends against the government’s received gender-sexuality orthodoxy, then we take a step toward the postmodern age of anti-enlightenment, where the only academic inquiry permitted is that which exhorts the zeitgeist and bolsters received opinion – such as that propounded by Universities Minister Jo Johnson. To which nothing more was heard.